How do you make money in this business (photography)? You ask for it. 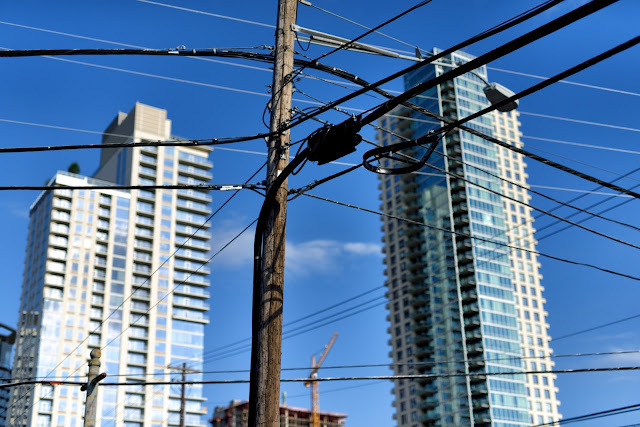 A tangled view of downtown Austin. First, let me set the stage. I grew up in a middle class family and we never talked about money. My parents always seemed to have enough and anything they denied me (a Pontiac GTO 6.5 liter....?) seemed to be more of a Calvinistic choice than a result of any financially motivated deprivation. Then I went to college with the help of both my parents, and few scholarships, and that seemed pretty straightforward as well. It's only when I finished school and started trying to figure out how to make a living that things got scary and complicated. Asking for money---and then asking for more money was something I had never practiced, never prepared for. As a consequence I didn't do it well. A series of menial or boring jobs soon followed and I believed that there was set amount allocated for each of these jobs, that the allocation was unchangeable and that I could: take it or leave it. I think most of us start our "adult" job life thinking that everything is calculated in the number of hours worked x the rate of pay and we grudgingly leave it at that until we realize that we are being financially under-rewarded for our perceived efforts and we go looking for a better job. It's the hourly thing that's the first hurdle. The second thing that hamstrings employees and inexperienced freelancers is the idea that the buyer or employer holds all the cards, that there is an endless stream of equally talented people waiting to take our places and that we must, inevitably, invariably capitulate to the client's desires and accept the proffered deal. Hmmmm. No wonder so many freelance photographers are poor. We seem to be bargaining from a no-win position all the time. Let's take the first idea, the pay by the hour concept. An image has a value that's elastic. If you are buying an image because you need something to grace your ad in a small church newsletter you probably base your budget on the draw or profit expected from the ad. The quality of the image has some value but the overall equation the image is part of is small and so the budget is constrained. You'll have a hard time convincing that local, small town realtor that her headshot for the church newsletter is worth your mortgage payment and I wouldn't try to convince either of you otherwise. But imagine the other extreme. Say you are working on a project for a multi-national corporation that sells very valuable high technology services and equipment in 145 countries around the world and earns tens of billions of dollars per year. Perhaps they need an image of a person as well. But imagine that this image is to be the basis of an ad campaign that will be used by the company internationally for the better part of a year.